I like to compare a lot of things to Marmite. It’s a love it or hate it simile that I often roll out. But there’s one comparison that rings very true. Mayonnaise. I hate it – will you join my campaign? I have a complete aversion to the white, gloopy mush that is mayonnaise. When you don’t like a particular type of food, like tomatoes or ham, it usually isn’t a problem – you can just avoid them. But when it comes to buying a sarnie or burger, the dreaded mayo is difficult to avoid. I’m not allergic to it, nor do I have any qualms with the home-made stuff. It’s only made up of egg yolks, oil, a bit of vinegar and seasoning after all. But the white, anaemic mess that oozes its way out of jars, to me, looks like it’s been squeezed out of a teenager’s greasy face. Ugh. I’m sure most of you are reading this with a blank and unsympathetic look on your face, but let me draw out my Marmite comparison. Imagine that every sandwich is not drowning in a liberal slosh of mayo, but is instead swimming in Marmite. So in my imaginary Marmite world, you’ll have to tread carefully come lunchtime, otherwise when you chomp down on your supermarket sandwich, you’ll get a face full of salty brown treacle. Maybe you’re more sympathetic to my cause now? Despite what you might think, I’m not alone. This Conversation originated from another earlier in the week. McDonald’s has pledged to put calorie counts in its restaurants, a decision that commenter Wavechange hopes will discourage them from using mayonnaise in their fillings. ‘I’m glad to know I’m not the only one who hates mayonnaise,’ Wavechange added in response to my aversion. It’s fatty, it’s gloopy, it’s greasy – it’s quite simply gross. Naturally, that’s just my opinion, and I wouldn’t like to deny mayonnaise lovers their favourite sauce. But give me a decent choice. Why is its marriage to sandwiches and burgers so faithful? Thankfully, some sandwich chains have caught on. EAT, for instance, includes mayo-free sarnies on its shelves, with capitalised labels pointing them out. But they only feel like token gestures, making us mayo haters feel like charity cases. Some choices are hard to understand why they’re left out of our reach. Why would you need to add greasy mayo to a brie, ham and cranberry sauce baguette? It already has cranberry sauce in it – why do you need two!? This means that my love for brie and cranberry is left unfulfilled. All I’m asking for is choice. And I’m sure dieters dislike having fattening mayonnaise rammed down their throat all the time. Maybe we should take this campaign in a more militant direction. Our manifesto could be centred around the following demand – there must be NO mayonnaise in any sandwich or burger. If you want it, you’ll have to buy a sachet. Sadly, that’s what we’ve been driven to. Do you love or hate mayonnaise? Yes, I so agree with you! Although I think your manifesto is too ambitious – I would just settle for a slightly broader range of sandwiches that aren’t dripping mayonnaise. Even if 70% of them still have mayonnaise, I’ll live with it – but please, sandwich shops, can’t you at least do more than ONE sandwich that isn’t??! I neither love it nor hate it. So I can’t vote. I may add it to food that would otherwise be too dry (but then I may use lemon juice instead). I may use it as a more nutritious alternative to butter in a sandwich. I may even use it as a dip with chips, as an occasional alternative to ketchup, when having a snack in a pub. But I’m just as happy without it. Pity there’s no middle option in your poll. I can see you’re not in the love it or hate it brigade. I do understand that a middle option would be a good idea, but I’m hoping people won’t sit on the fence. If you eat, I suppose you should vote for ‘love it’. I can have it in foods & sandwhiches without it upsetting Me, Nor Do I Avoid It If Its In An Sandwhich Filling. Alhough I agree people & customers should have an choice in wheather mayonnaise or butter is in Your Sandwhiches. You Should Add An Not Fussed Either Way Vote Section For Mayonnaise. Maybe replace mayonnaise with salad cream, Or lemon juice, black pepper, spices, & Other things to breing flavour to the snadwhiches. Salad Cream? Yuk. That’s not a good alternative. Plastic knives and sachets are certainly a good idea. Thanks Patrick for starting the campaign. I’ve have found mayonnaise hidden in three sandwiches this week. Dietary advice is usually to cut down fat in our diet, so why do we have all this gratuitous grease in sandwiches. Mayonnaise features in coleslaw and that is becoming increasingly common in pub food. Roast beef, Yorkshire puddling, the odd vegetable …… and coleslaw! And, of course, coleslaw finds its way into sandwiches too. Incidentally, it wasn’t me said, of mayonnaise: “It’s fatty, it’s gloopy, it’s greasy – it’s quite simply gross.” Well said, though. I can put up with coleslaw if greek yoghurt is used instead, but still not the biggest fan. What’s wrong with a salad? And yes, you didn’t say that. Hopefully that was clear by the punctuation. I’m sorry if it wasn’t. I can’t vote either because I LOVE the home-made stuff and would live on steak with mayonnaise if I could, but I HATE the chemical-tasting factory-made stuff and don’t want it anywhere near my ham sandwich. And no, please no, don’t replace it with salad cream. Whoever invented that stuff? It’s even worse! Don’t get me started on 1000 Island dressing. Oh agree, the home-made stuff is worlds apart to the puss (sorry) you find in jars. But if you don’t like the jarred stuff, or what you find in supermarket sandwiches, then please vote on the ‘HATE’ option! Thanks. Actually quite like stuff freshly(?) made for/in salad bar. is it safe to eat 18 months after purchase? I don’t buy shop sandwiches – I make my own without butter – mayonnaise or salt. Strangely I find them tasty. Marmite is just as bad – haven’t eaten it in over 40 years. But if I was hungry – I’d eat anything without complaint. Ooh, I love Marmite – but you can leave me out of Vegemite taste tests. I should be more organised to make my own sandwiches in the morning, but shouldn’t there at least be a choice for people who dislike or are allergic to mayo (due to eggs)? I like mayo but why do sandwich bars and retailers fill their products with full-fat mayo? We use Hellman’s EXTRA light mayo at home and we can only notice a subtle difference in taste to the full fat version and personally i find it more refreshing and less heavy. We’ve got so used to it that, like semi-skimmed milk, the full-fat version makes you reek when you taste it. But salad cream? My word, people will tell me they still own G plan furniture and corduroy trousers. Yes – salad cream is still available. From memory it is slightly less greasy and disgusting than mayo. The extra light mayo you mention has much less fat but the ingredients list suggests that it belongs in a chemistry lab and not on the dining table. G Plan furniture is still around and will probably be remembered when cheap Swedish furniture with strange names is a distant memory. Some corduroy trousers are quite respectable and the great advantage is that the don’t have to be ironed. I completely agree. Why do so many sandwiches have mayonnaise in?! It’s pretty much impossible to buy anything in Pret. Personally I hate the stuff and would rather have mayo and butter free sandwiches please. I did read that pre-packaged sandwiches need to have one or the other though – apparently it creates a barrier to stop the bread going soggy. Hmmmm true or just an excuse from those sneaky mayonnaise lovers…. That’s interesting to hear. Butter isn’t a sauce in my eyes – so I’d go with that every time. The ‘saucy’ people amongst us can buy themselves a sachet. Though maybe that’s too mean? I hate mayo too. Most of all when I’ve bought a sarnie that you wouldnt dream would have it in….I got a chicken tikka sarnie the other day and realised moment I bit into it that it was loaded with the vile stuff. Chicken tikka? Mayo? Why??? I think it’s mainly cos it’s a cheap filling. So they’re really ripping everyone off (including mayo lovers/likers). It would be nice if it was optional (wouldn’t make people buy it, that’s like reversing the prejudice). Obviously things like Tuna Mayo (I make a mayo free one using Tahini -sesame seed paste and lemon juice) or coronation chicken are meant to have mayo and should stay that way but it’s when they put it in everything that I object. I’d be happy with 50/50 mayo versus mayo-free sandwiches. That would be fair. Also, when I’ve ordered a Burger (Burger King) I’ve specified no mayo (lying saying I’m allergic so they take me seriously) and it came with. Vile. So only safe bet is McD hamburger cos it comes without but the meat is like cardboard. I often wonder why every single sandwich is dripping in mayonnaise, I hate it. Why is it assumed that you want all this in your sandwich, surely if it contains mayonnaise then they should put a large label on it. BLT AND MAYO or Chargrilled chicken WITH MAYO. I really like mayo in sandwiches, although your comment that mayo “looks like it’s been squeezed out of a teenager’s greasy face” almost swayed me towards hating it. But I can understand why mayo-haters get annoyed – it does seem to be added to almost every sandwich. It seems weird given that there are so many brilliant alternatives – how about more sandwiches with pickle in? Dijon mustard? Or different kinds of chutney? I guess they’d be a bit more expensive, but I reckon I’d pay extra for a nicer sandwich with some sort of delicious chutney on it. Mustard? Chutney?! No thanks – those are just as bad. Next you’ll be suggesting Ketchup! Is there a need to have sauces in sandwiches? Sandwiches = bread, butter, lettuce and meat. Or perhaps my tastes are too simple? Oooh, or maybe shops should start selling ‘build them yourself’ sandwiches, where they give you all the delicious ingredients of a sandwich, along with two slices of bread and a selection of sauces, and you then throw in all the bits you want. You can then give me all your unwanted pickle/mustard/mayo so that I can have a sandwich with extra sauce – win/win situation? I’d prefer sandwhiches didn’t have butter or mayo, As I agree some Mayo sandwhiches can be yuk, Others like tuna need something to hold the tuna in place. 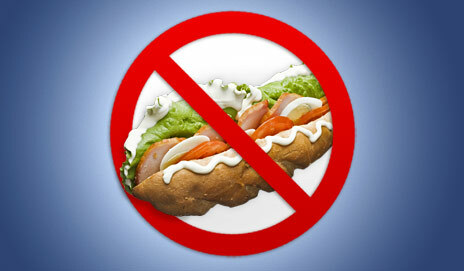 There has got to be a more healthy alternative to mayonnaise to keep tuna and other fillings in sandwiches. Yes, like a little bit of plain yoghurt. Other options: Yoghurt, Creme Fraiche, what about guacamole? (beware, some ready made ones have been known to have mayo in them?!?). Basically anything spreadable (just had rude thought there). Need to make sure not overpowering flavour tho and watch liquid content lest you end up with the dreaded soggy sandwich. Great options, thanks for the tahini idea. I’ve just closed the poll on this Convo and I’m disappointed to see that quite a majority ‘love’ mayonnaise. It’s not quite the Marmite I thought it was. I am, however, heartened to see so many people support at least the choice of mayonnaise-free options. Ah, well that’s very good to hear Scott… I’ll have to go and find myself a Greggs! I am so glad someone has finally come out and said this. I couldn’t agree more. I am slightly biased, however, as I AM allergic to mayonnaise (not massively, but enough to make me feel yucky.) As I am tryping this, I have just started tucking into a Wiltshire Ham and Piccalilli sarnie (that I did grab in hurry i’ll admit) and have just realised this also has mayo on! WHY? What is the need? It has one sauce on already! Why must supermarkets put “Turkey and Cranberry” with Mayo ?! Plus, in this now weight conscious, surely it makes sense to have less mayo sarnies…..
Too right Tammoth, nice to have you on board – and it’s even more important since you’re allergic! Have you found one store that’s better at no-mayo sandwiches? To be honest they all seem as bad as each other. I’ve found places like Pret and Eat to be a bit better but I still find I have to read everything and am limited on what sandwiches I can have. It’s so frustrating. I am not one for eating fancy foreign muck, so when in Paris and hungry I ordered a cheese baggette at this street cafe. Without a by-your-leave, it arrived swimming in drippy gloop. Without the gloop, I would have loved it. They had ruined it, and all I could do was eat the odd un-glooped bit. On my next foray to Paris, I bought the bread, and the cheese, and put it together on a park bench. Give me butter or margarine on my sandwiches from a supermarket, or plain. The ‘No Mayo’ brigade grows – great to have you on board! In an ideal world, the mayo would be hand-made and the additional sauces would just reflect the design of the sandwich. Every sandwich at Pret for example has factory-made mayo in it, even when it doesn’t call for it at all – take the Hosin duck wrap for example. I really think that with todays demands it would be far more profitable to offer a varied choice, show a little more creativity and intelligence. Making a healthy wholesome sandwich can be easily achieved if they hire a clever chef to design, (within a budget) the alternatives that don’t need mayo in them to make them a mouth-watering success. I’m with you there – home-made mayo and factory made are worlds apart. And you’re doubly right about the hoisin duck wrap – what’s the need for a second sauce?